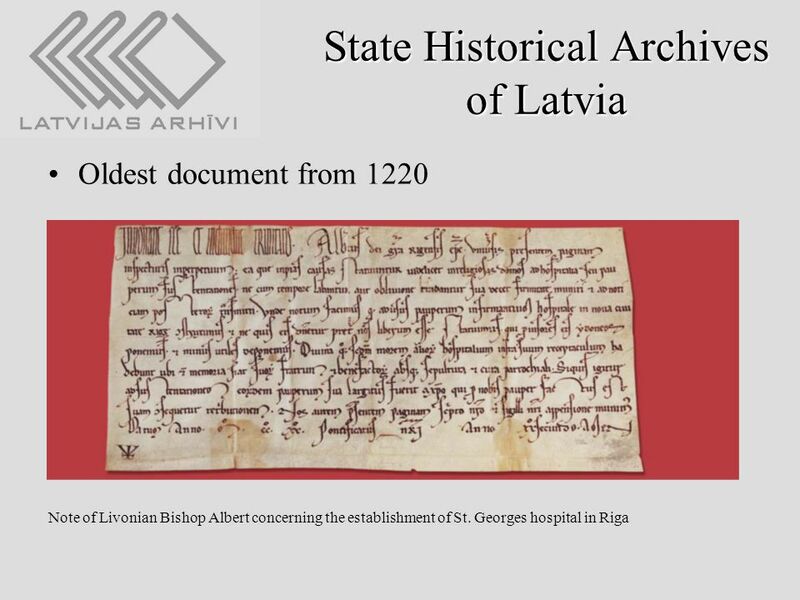 Archives in Latvia. 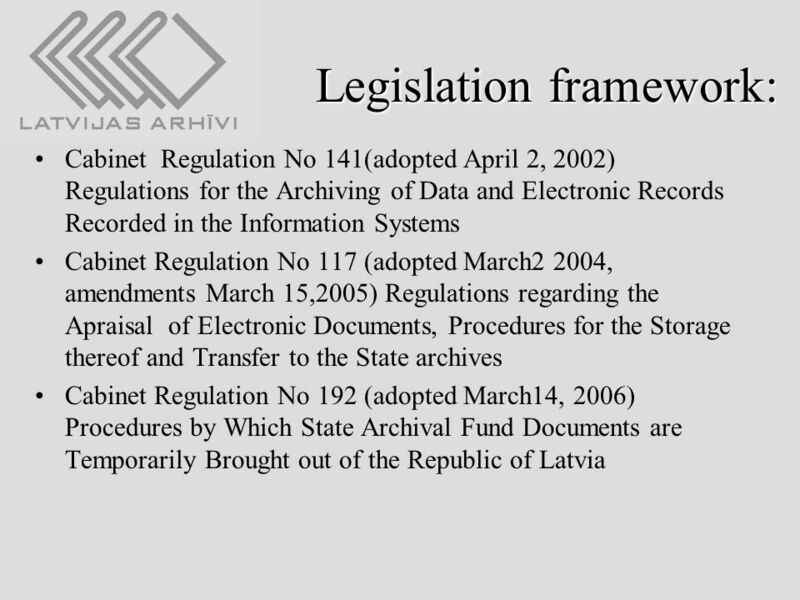 Legislation framework: Law “On Archives” (adopted on March 26, 1991, amendments on November 4, 1993, November 11, 2000, and March. 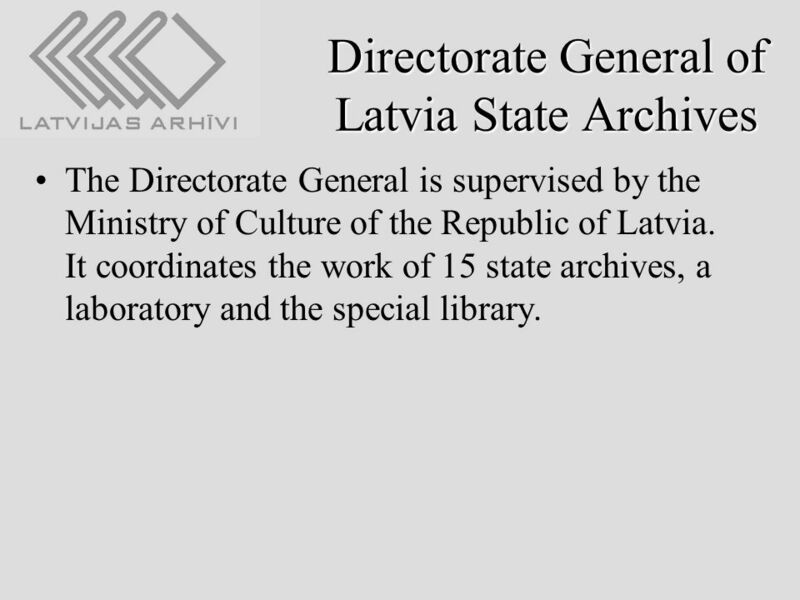 6 Directorate General of Latvia State Archives The Directorate General is supervised by the Ministry of Culture of the Republic of Latvia. 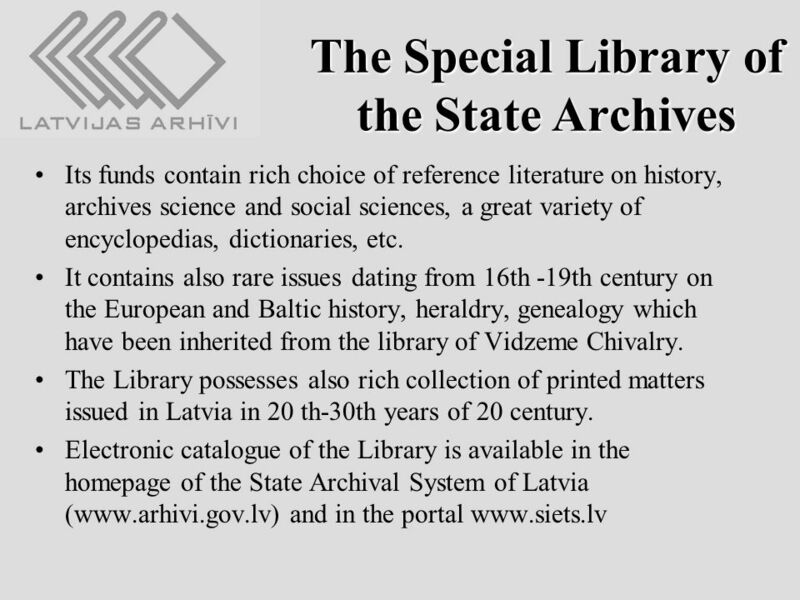 It coordinates the work of 15 state archives, a laboratory and the special library. 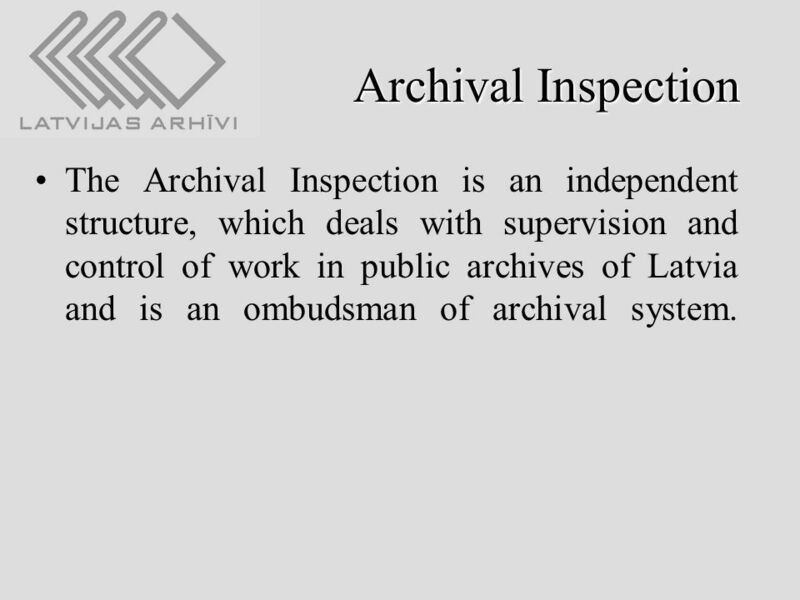 7 Archival Inspection The Archival Inspection is an independent structure, which deals with supervision and control of work in public archives of Latvia and is an ombudsman of archival system. 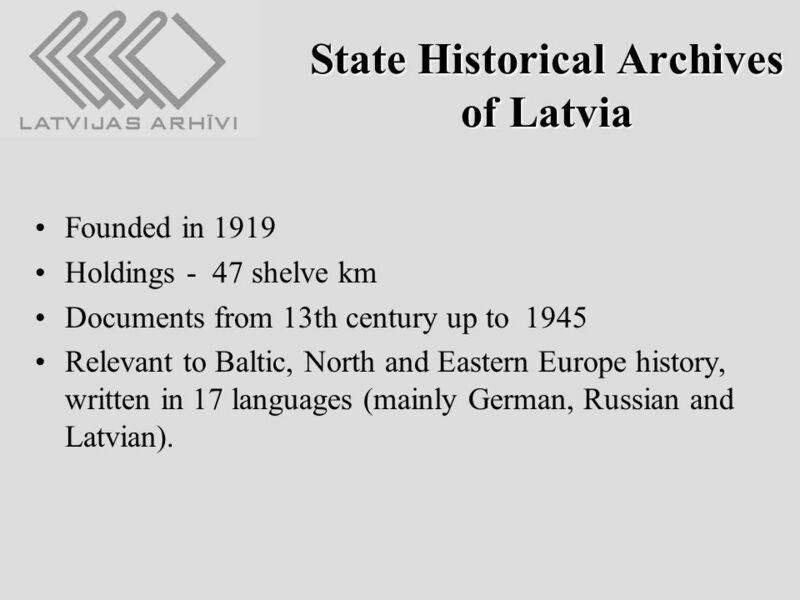 9 State Historical Archives of Latvia Founded in 1919 Holdings - 47 shelve km Documents from 13th century up to 1945 Relevant to Baltic, North and Eastern Europe history, written in 17 languages (mainly German, Russian and Latvian). 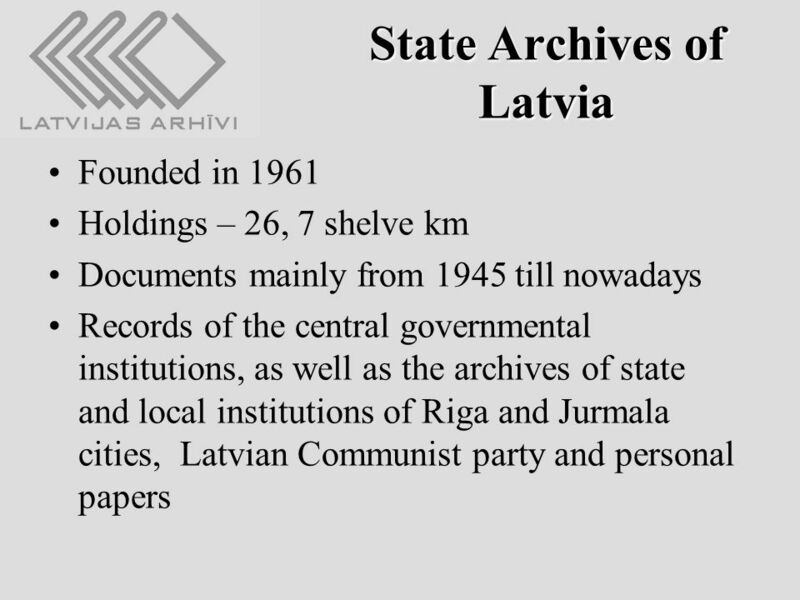 13 State Archives of Personnel Records Founded in 1992 Holdings - 23 shelve km Documents mainly from 1945 till nowadays There are personnel records of the privatized and abolished local and governmental authorities Riga and Jūrmala, there is a number of archives of bankrupt firms too. 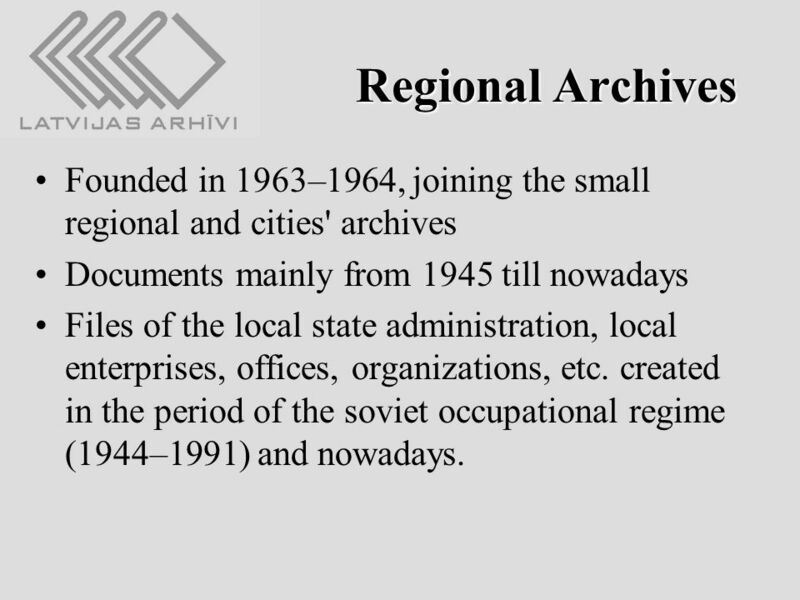 14 Regional Archives Founded in 1963–1964, joining the small regional and cities' archives Documents mainly from 1945 till nowadays Files of the local state administration, local enterprises, offices, organizations, etc. 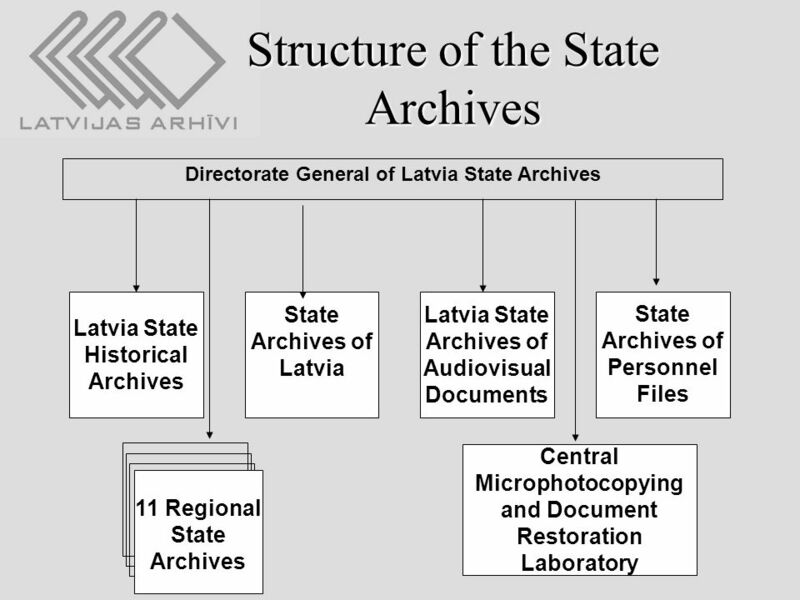 created in the period of the soviet occupational regime (1944–1991) and nowadays. 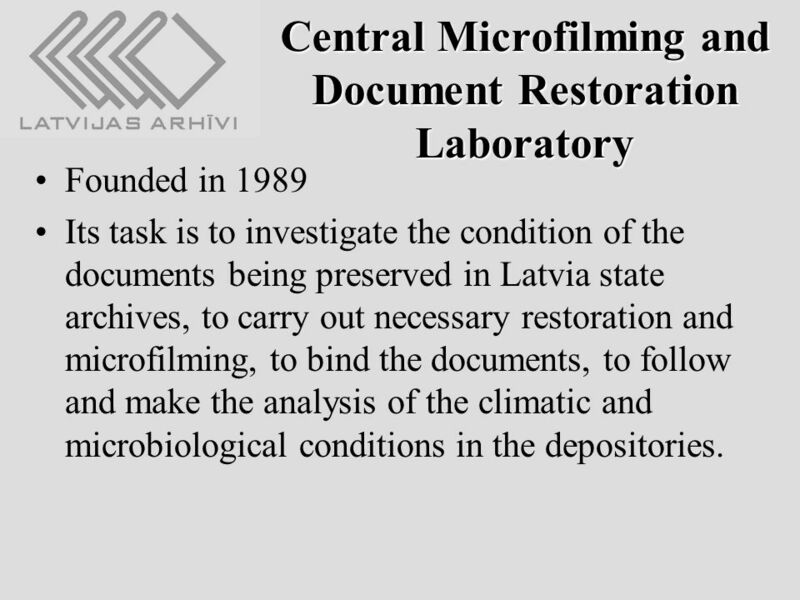 15 Central Microfilming and Document Restoration Laboratory Founded in 1989 Its task is to investigate the condition of the documents being preserved in Latvia state archives, to carry out necessary restoration and microfilming, to bind the documents, to follow and make the analysis of the climatic and microbiological conditions in the depositories. 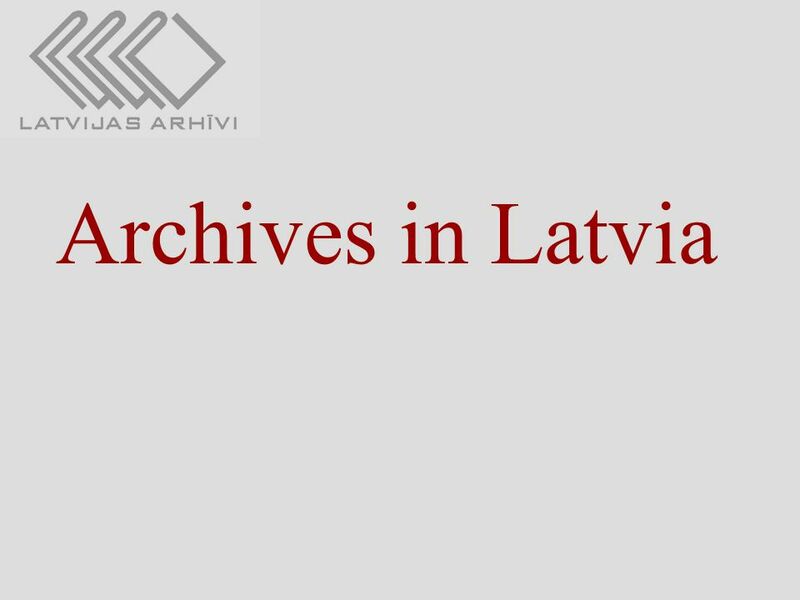 Download ppt "Archives in Latvia. 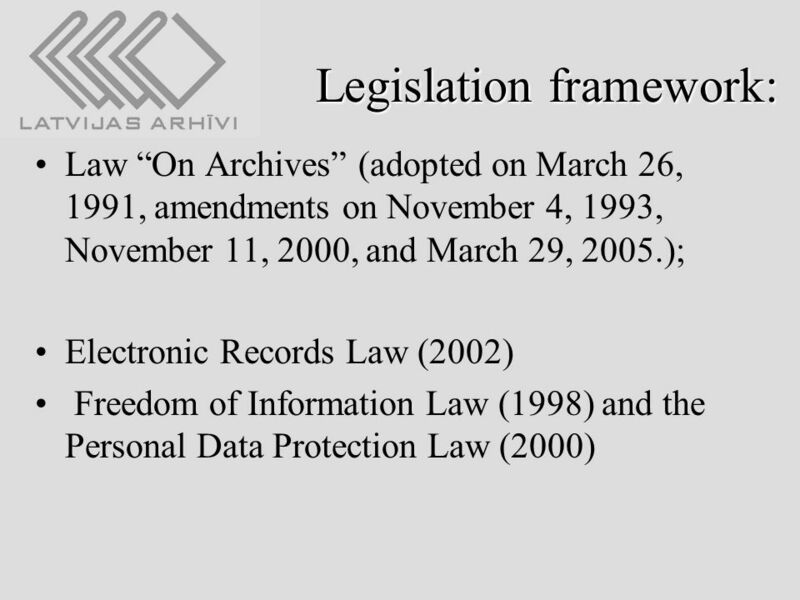 Legislation framework: Law “On Archives” (adopted on March 26, 1991, amendments on November 4, 1993, November 11, 2000, and March." 1 Isolation and Quarantine Protocol Public Health Seattle and King County 2004. Advanced Issues in HIPAA Research Compliance The Sixth National HIPAA Summit March 27, 2003 Kim P. Gunter Senior Consultant. © fedict All rights reserved Legal aspects Belgian electronic identity card Samoera Jacobs – November 2008. 1 Informatization Status & Development Plan of China Cultural Heritage Luo Jing Director of Division of Conservation Science & Information Department of. Government of the Republic of Serbia Ministry of Labor and Social Policy GENERAL AND SPECIAL PROTOCOL ON CHILD PROTECTION FROM ABUSE AND NEGLECT. SOCIAL WORKER: AN IMPORTANT ACTOR IN THE CHILD CARE REFORM. March 2007 Mi Kyung Lee National Assembly Library of Korea. 1 Post-1949 Chinese Local Gazetteers: Digitization and Collaborative Collection Susan Xue Electronic Resources Librarian University of California at Berkeley. International Financial Reporting Standards The views expressed in this presentation are those of the presenter, not necessarily those of the IASC Foundation. GEOSTATISTICS IN LATVIA CSB of Latvia in cooperation with State Land Service &Geospatial Information Agency Geostatistical Conference – Kongsvinger, Norway. ROLE AND RESPONSIBILITIES OF THE NATIONAL COMMITTEE OF THE COASTAL ZONE AND ITS PERMANENT TECHNICAL SECRETARIAT Theory and practice. 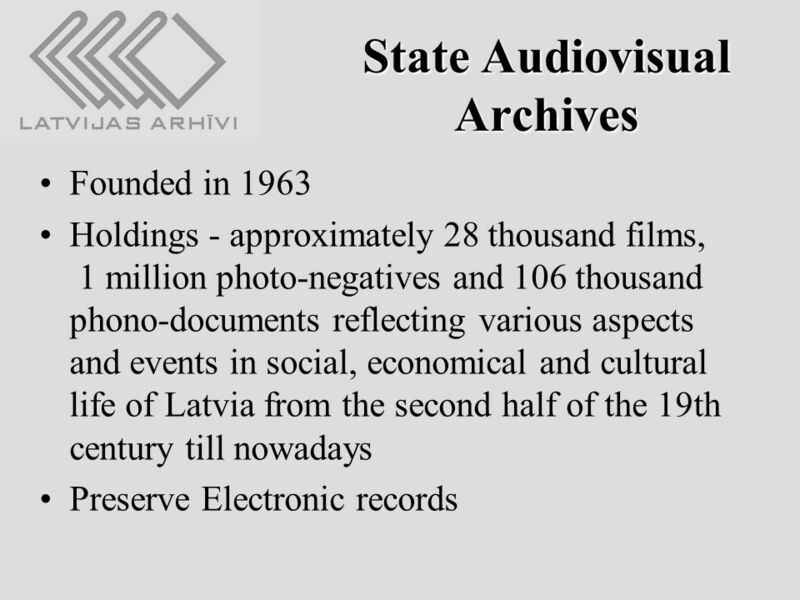 Kristīne Pabērza Ministry of Culture State Agency Culture Information Systems Latvia Member States' Expert Group on Digitization and Digital Preservation. September 13-16, 20055th International PHOTOMOD User Conference, Jurmala, Latvia 1 DEVELOPMENT OF PHOTOGRAMMETRY IN THE STATE LAND SERVICE OF THE REPUBLIC.